Sea ice located along the shallow continental shelf of the Bering Sea usually provides a diving board, a hunting perch and resting place for female walrus and their young. With sea ice retreating into water too deep for hunting, the walrus have had to find safer shores. Around 10,000 of them have gathered on a small barrier island near the village of Point Lay in northwestern Alaska. They were photographed by the National Oceanic and Atmospheric Administration (NOAA), which has been carrying out aerial surveys of marine mammals in areas of potential gas and oil development. It’s not the first time the walrus have gathered on dry land to escape treacherous waters. While there, they remain more vulnerable to hunters, polar bears, and other stress factors that have, in the past, prompted deadly stampedes. What looks like a termite mound here is actually a massive walrus pod. This clickable image can be enlarged. I’ve written several times about the ongoing discussion surrounding the American eel. More specifically, the harvesting of young eel – elvers – during their spring run along the American East Coast in spring. Prices for live elvers have skyrocketed over the past few years due to high demand in Asia, where the local populations have been decimated by overfishing, environmental pressures and natural disasters. 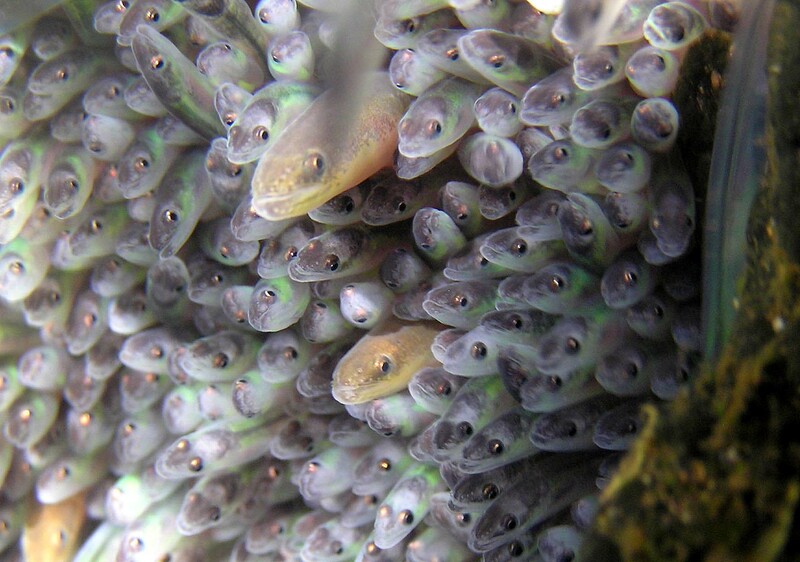 The young eel are shipped to farms, where they are grown to adulthood and sold for consumption all over the world. In light of how little is actually known about the current population and health of the eel population, there was talk earlier this year of tightening regulations when it comes to fishing elvers. This has, for the moment, been postponed until further notice. The Atlantic States Marine Fisheries Commission’s American eel management board has been unable to reach a consensus, likely pushing any decision until right before the 2014 season starts in early spring. My overview of the American eel is here, with some of the other posts here and here. A good discussion of the current fraught situation is here. One of the more obscure objects of international animal smuggling is the odd pangolin, the scaled anteater which inhabits its very own lonely branch on the mammalian tree of life. I’ve talked about them here, when I looked at seizures of illegal shipments. Pangolins are in demand because their scales (which are no different in composition than fingernails or hair) are used in some traditional medicines, while pangolin meat and fetuses are served as a delicacy in some East Asian cuisines. The pangolin is protected under the Convention on International Trade in Endangered Species of Wild Fauna and Flora (CITES). 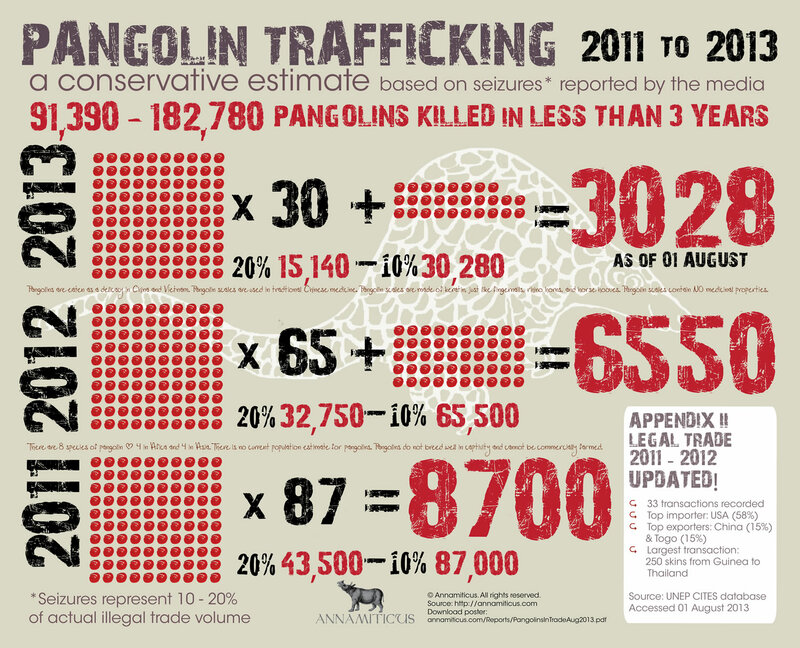 The pangolin is considered to be one of the world’s most trafficked animals, yet I find very little on conviction rates following seizures. Six men were convicted in Malaysia this year of smuggling 150 pangolins, sentenced to a year and jail and fined. Meanwhile, over seven tons of pangolin – some of them still alive – were confiscated by customs officials in Hai Phong, Vietnam. And in a baffling decision, the seized goods were auctioned off rather than destroyed, thus re-entering the illicit market. No mention of what happened to the smugglers themselves. The world’s first ever pangolin conference with the International Union for Conservation of Nature – Species Survival Commission (IUCN-SSC) Pangolin Specialist Group met in Singapore in July. Perhaps this will bring more attention this unique creature, hopefully before it is trafficked into extinction.